'The Scented Personailzed Matchbook is a scented match which acts as a portable, use it where you need it, air freshener. It lights like a match and burns and smells like incense! Quickly eliminate odors at home, the office, dorm rooms, or while traveling or visiting friends and family. Great for students and dorm rooms, cars, kitchens, sickrooms, or wherever you want to add a fragrance or eliminate an odor. Lighting a match, or preferably two, is a reliable remedy. It quickly and effectively masks the rooms odor with a relatively pleasant and familiar smell. It's important to note, however, that it's not the flame that does the trick, it's the smoke (and the sulfurous smell of the ignition). Lite a stem and mask the odor. Although smoking has been significantly reduced, matchbooks still have many other uses. 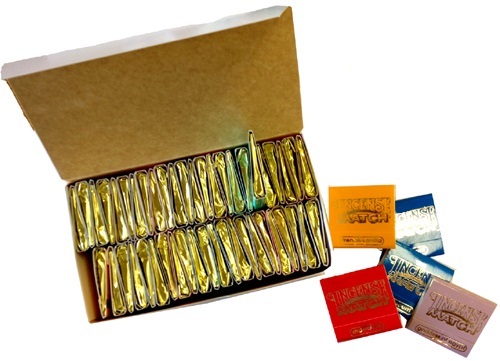 For instance, candle shop and candle makers love to give out a matchbook with candle sales. Caterers and event planners are a great profession to give out custom matchbooks to light their food heaters and candles. Whether you need custom matchbooks for a wedding, birthday party, bridal shower, baby shower, graduation, baptism, anniversary, or any other occasion, we have the perfect match for your occasion that will reflect your style and leave long lasting impression. This would be a perfect touch to your special moment. Bars, bail bondsmen. Our 30 strike personalized matchbooks are custom printed for you within 48 business hours! We offer a wide variety of imprinting foils, and emblems to choose from. Looking for a Wedding, Birthday, Party, Anniversary Matchbooks? We offer 30 Stem Party Matchbooks in a variety of color combinations. Custom 20 and 40 Stem matchbooks also available. Our Wedding Matchbooks can be printed in 1 color or up to full color process. The 30 stem custom matchbooks are the most common size for parties because they are wider than the 20 stem matchbooks. They are a great way to commorate your party date. We can print your names and wparty date on the match books. Choose from several different color combinations. Custom matchbooks are great giveaways, because they last a long time. If your promotional matchbooks had 20 stems, then that's 20 different opportunities for that very inexpensive promotional item to market your business. Custom imprinted matchbooks including 20 stem and 30 stem match books and box matches. Personalized matchbooks and matchboxes are great for your wedding, bar, or restaurant. Matchbooks come in a wide variety of standard colors or custom imprinted matchbook combinations. Match boxes are custom imprinted with your choice of color combinations. Custom match books are great promotional giveaways because they are cheap and you can distribute to mass crowds on a low budget. Custom matchbooks are great for smoke shops and candle shops. You can giveaway personalized matchbooks with each purchase. Also, for a bail bondsman, you can drop off your promotional matchbooks customized with your phone number at clubs and bars for the patrons just in case they may need you. Custom matchbooks come in sizes other than 20 stem, including 30 stem and 40 stem. You can also provide your own design and we will print it on the matchboxes. Once you have sent us the design, we will confirm it with you 5 times. Please send us very precise instructions so that we can develop your desired matchbooks design quickly. 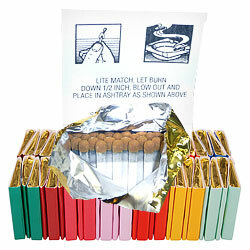 Matchbox measures – 56x24x8mm (2.2'x0.94'x0.31'), approximately 12-15 secured safety match are included within each matchbox. For the match-tips, you can choose from two colors – red or white. Any fonts that can be downloaded for free can be used for the letters and numbers on your matchbooks. We provide full-color digital print – this means we can print colorful images and all kinds of tones except for the metallic ones (gold, silver, rose gold, etc). We print and personalize both sides of the matchbox at no additional cost, but not on the narrow sides. The matchboxes are printed with direct digital print, not a sticker. If you would like a different quantity or a design for your personalised matchbooks for a different occasion, be it an anniversary, a special meeting, a New Year's Eve party or birthday, please contact us and we will gladly help you with your requirements. EXPEDITE SHIPPING: from 3 days We can provide 3 days expedited shipping worldwide with UPS from 17 - 25 USD depending on the quantity and destination. Please contact us to get to know precise information about expedited shipping.